Weather and climate is all around us. It affects our work and play. Disasters related to weather cause hundreds of thousands of deaths each year. Weather-related damage is in the billions of dollars per year. METEOROLOGY – The study of short and long-term weather/climate patterns including its effects on the biosphere. ATMOSPHERIC PHYSICS: Applying physical processes to meteorology such as aerodynamics, radiometry and geomagnetism. LIFE SCIENCE: Understanding how living organisms interact with meteorology. WEATHER & CLIMATE: Studying weather and climate from past, present and future. You can divide meteorology in different ways. But here’s how we see the branches of meteorology. The main focus of meteorology is the study of the chemistry and physics for weather/climate. For long term weather patterns, climatology studies the past and how climate change will affect the future. If you specifically want to study past weather patterns, paleoclimatology examines how prehistoric climates have changed in a geologic time scale. Paleotempestology is specific to tropical cyclones. Meanwhile, barometry studies atmospheric pressure is measured and how it relates to weather and climate. Topoclimatology focuses on topographic relief and how it influences local climate in the lower air layer. CLIMATOLOGY – How climate (long-term weather patterns) has varied in the past and how climate change will affect the future. METEOROLOGY – How atmosphere chemistry and physics relate to weather and climate patterns. TOPOCLIMATOLOGY – How topographic relief influences local climate in the lower air layer. BAROMETRY – How atmospheric pressure is measured and relates to weather and climate. PALEOCLIMATOLOGY – How prehistoric climates have changed in a geologic time scale. PALEOTEMPESTOLOGY – How tropical cyclones have changed in a geologic time scale. 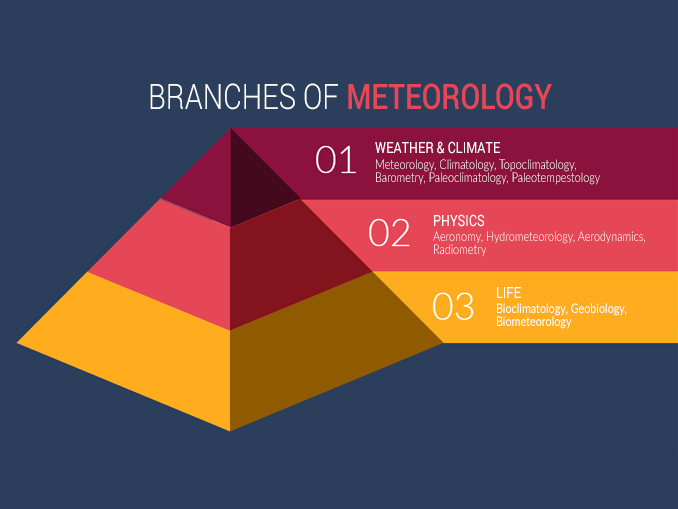 The physical processes in weather and climate can be described in one of these branches of meteorology. For example, aerodynamics describes how air circulates in the atmosphere. We use radiometry to measure incoming solar radiation from the sun. Next, hydrometeorology focuses on how this energy is transferred between the land surface, water and atmosphere. AERONOMY – How chemical and physical properties are composed in the upper region of Earth and planets. RADIOMETRY – How electromagnetic radiation in the atmosphere is observed and measured. AERODYNAMICS – How air circulates in the atmosphere. HYDROMETEOROLOGY – How water and energy are transferred between the land surface and atmosphere (hydrologic cycle). GEOMAGNETISM – How Earth’s magnetic field changes at different time scales including pole reversals. Meteorology had tremendous impacts on the biosphere. And there are several branches of meteorology that are concerned with this aspect. For example, biometeorology measures how atmospheric conditions and short-term weather patterns impact living things. It may examine photosynthesis in plants or evapotranspiration rates in different seasons. There’s also bioclimatology which addresses how long-term climate patterns affects living things. This includes elements from geobiology which relates the lithosphere, atmosphere and biosphere. BIOCLIMATOLOGY – How climate interacts and affects living things. GEOBIOLOGY – How the biosphere relates to the lithosphere and atmosphere. BIOMETEOROLOGY – How atmospheric conditions and weather patterns impact living things.